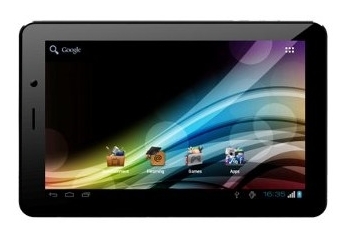 Micromax's new Android tablet Funbook 3G P560 spotted online for sale at Rs. 8,799. It come with 7 Inch capacitive touchscreen with 800 x 480 pixel resolution. The device runs on Android 4.0 Ice Cream Sandwich OS and it powered by 1.0 GHz Snapdragon MSM7227A Qualcomm processor with 512 MB of RAM. The device offers 4 GB of internal storage space and external storage space support up to 32 GB using MicroSD card slot. For camera, it has a 2.0 Megapixel rear camera and 0.3 Megapixel VGA front camera. The tablet has voice calling facility and 3G, Wi-Fi, Bluetooth, and USB connectivity options available. It built-in with 3,200 mAh powerful battery. It gives up to 160-hrs standby and up to 5-hrs browsing time. The company Karbonn also launched new tablet named as Karbonn Ta-Fone A34 that also compete with Micromax Funbook 3G P560 features but Karbonn Ta-Fone A34 features Dual SIM card slot and price less than Micromax Funbook 3G P560.